Did you know? Some experts think cubicle farms are similar to zoos, in the way they modify behavior. If your workers are feeling the bite of captivity, perhaps finding ways to let them out of their cages can help! Psychologist and corporate consultant Judith Heerwagen says you don’t have to get rid of cubicles – just ensure that workers don’t feel trapped. “Sometimes the best thing for workers to do is to leave the workplace altogether and work from home or at a coffee shop,” she says. With the advent of VoIP, mobile phones and the ability to “plug in” almost anywhere, this is a viable options for some – but for others, how can you lessen the closed-in feel? “People communicate better when they can see one another,” says Heerwagen. Since open offices are in decline and the traditional gossip at the water cooler option has faded with the dwindling of the regular enclosed office, most conversation now happens within cubicles. Low-partitioned cubicles can relieve some of the closed-in feeling, and allow for spontaneous collaboration as workers pop up to ask a colleague a question. 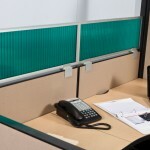 Varied cubicle extenders can help workers who feel they need more privacy attain the level of seclusion desired, while less easily distracted employees can enjoy a line of sight to co-workers. The psychology of cubicle farms can also be addressed by layout – setting up cubes so that workers have their side to the opening instead of their back automatically reduces stress – humans have basic instincts telling them not to leave their backs unprotected, and many workers report a sense of security and “weight being lifted off shoulders” when their cubicle is reconfigured so their back isn’t to the gaping entrance to their cube. Another option is the idea of shared space – combine two cubicles into one, design around seating for two people, and allow co-workers who commonly work together on projects to share space and resources. Alternately,. 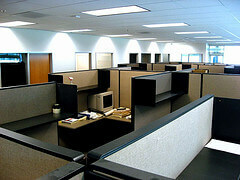 allow co-workers to come in on different shifts and take turns using a larger cubicle. Same amount of work, same number of employees, twice the legroom! Don’t let your cubicle farm feel like a zoo. Allow your workers some say in how their cages are configured, look into cubicle extenders to provide customizable workspaces, and see higher productivity and better employee job satisfaction! It’s Friday, and let’s talk about one of the most annoying things in the office around the holidays. No, it’s not the canned music that seems to start up in early November, or the cubicle decorations that get out of control – it’s the office sweater party. Amarite? Every cubicle worker knows about the ugly sweater party. It’s a horrible perversion of the traditional Christmas Party, the one for which everyone could dress up nice and get tipsy and maybe a little office romance would finally spark. Of course, maybe that’s the point. No-one is getting it on with someone wearing one of the ugly Christmas sweaters…. I mean, have you seen these things? It’s like an elf threw up on your grandma’s nightgown. What’s your holiday pet peeve? Tell us about it. we know you’ve got one. Maybe it’s something that bugs you a little all year round, but Christmas just takes it to Defcon 4 status. Talk to us!